An interview with Gary Ryan, author of What Really Matters For Young Professionals! Expertly interviewed by Dr Andrew O'Brien, Gary Ryan provides the background to the book and explains the key concepts that the book addresses. For your convenience the interview has been split into small parts. * What was the background to the book being created? * What are 'Employability Skills'? * What is the background to the title of the book and who are Young Professionals? * How can Young Professionals and the more senior staff they work with connect with you? * How would you summarise the book? * Why did you develop the Online Course? * How might Young Professionals fund the Online Course? For more information on the ebook and Online Course please follow this link. In highly competitive times it makes sense that good service is good business. Even though customers are not particularly loyal, providing great service consistently and over a long period of time makes it all the more difficult for your competitors to attract your customers away from you. While your customers will try out the competition, if they do not receive a higher and consistent standard of service than your organisation provides, then your customers will come back and be less inclined to try out the competition again. 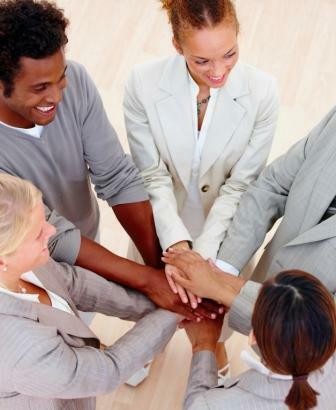 Implicitly your customers will trust you (just as you, in turn, trust your staff). It is however, good practice to maintain a healthy tension about your customers trying out the competition. The day that you either think that you don’t have any competition, or the day that you stop providing good service on a consistent basis, is the day that your organisation will start to decline. No job is secure. But good, consistent service increases the security of every job, every department and every organisation. Good service IS good business! "Great service actually feels good. It feels good for me, it feels good for the people I’m serving and it keeps the business humming along. To me, good service just makes sense." Please feel free to ask a question or to make a comment about this article. Once again Chris Abbey articulates his experience over two articles (Part One & Part Two). They are worth reading irrespective of the stage of your career and his insights about using the experience to help you to become even better are powerful. He certainly describes what my experience has been! A recent report published on the CIO website indicated the Gen Y are now more loyal to their employer than they have ever been. For a number of years I have been arguing that Gen Y are not as different as the older generations like to claim that they are. I'm not suggesting that as a generation they aren't different, what I am suggesting is that the degree of difference is not as high as some have been arguing. It is little wonder, therefore that when the economy has changed Gen Y, when asked if they plan to stay or go have responded with a resounding increase in, "I plan to stay!" Gen Y aren't stupid. There's no point being 'mobile' in your career if there isn't anywhere to go! My hope is that Gen Y don't lose their intolerance for organisations not matching what they say. I have experienced too many people in the older generations who wish that their organisation's culture was better than it is. But many of these people stay in those organisations for fear of not getting another opportunity elsewhere. Unfortunately this means that the organisations don't change like they should. Gen Y may have a serious impact on organisational cultures over time because they may make them more accountable. While there is good reason to celebrate the reported increase in Gen Y 'loyalty' my hope and belief is that they are just plain smart and they'll be loyal while they are shown loyalty themselves. I also believe that they will continue to take responsibility for themselves and their career development far more than previous generations. Such action comes with being 'employably mobile'. A nine month project has been concluded with the launch of the What Really Matters For Young Professionals! 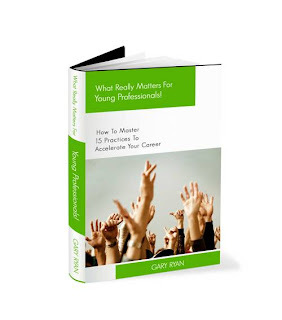 How To Master 15 Practices To Accelerate Your Career ebook being launched today! An Online Learning Companion Program has also been created and is now available as well. The printed version of the book will be available in approximately six weeks. After eight months of solid work by Andrew and myself, the new Organisations That Matter website has been launched. Our website address is exactly the same however we now have the capacity to better communicate what it is that we do, as well as provide Online Courses, ebooks, webinars (online seminars) and much, much more! You may wish to check out our Free stuff as a place to start. Over the next couple of weeks we will be testing our new webinar software so please look out for our free webinars while we learn the software - they won't be free for long! We will continue to operate The Organisations That Matter Learning Network and it is now part of our "orgsthatmatter.com" website with direct links from the website to this network. In addition many of you may have already discovered that the web address http://otmlearningnetwork.com now takes you directly to this network, so you might like to bookmark that address on your web browsers. While Andrew and I have worked very hard to ensure that our new website is error free, if you notice that a link doesn't work, or we have missed a typo, please let us know. Please send me an email at Gary.Ryan@orgsthatmatter and include a link to the page that contains the error. Your help, as always will be highly appreciated.